Medical Coding Practice Exam: Get Ready for Your Medical Coding Test! This exam consists of medical coding questions which cover all the necessary information for medical coders and medical billing specialists. 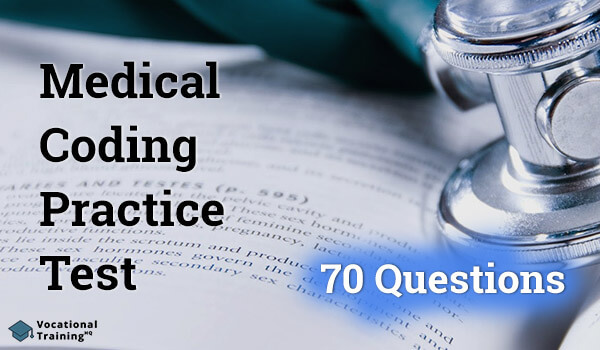 The topics included in this exam are: coding by body system, coding by a procedure (CPT®) and department, ICD-9-CM, HCPCS Level II, Anatomy and Vocabulary, Practice and Evaluation and General Coding Guidelines. Please mark the appropriate code that ought to be given by a pathologist who performed an analysis of 2 distinctive biopsies from the vaginal wall and 1 from the cervix. The pathologist should code with 88305, with 4 units which refer to the four distinctive biopsies. Please mark the correct code for the dialysis care of a 2-year-old patient who has been suffering an end-stage renal disease and was receiving dialysis twice a week while expecting for a kidney transplant. During the last month of life, he was administered with dialysis once a day between June 1st and June 14th. Please mark the appropriate modifier for a case of a 32-year-old woman with repeat urinary tract infections whose urine samples have been sent to a lab by the physician who suspected another UTI, in order to a identify the bacteria. The physician's office billed for the lab service, although the sample was sent to an outside lab. Modifier-90 is the correct modifier in this case. Modifier -90 is an Outside Laboratory modifier and it is used when the physician's office bills for the laboratory service, even though they sent the lab sample to an outside laboratory. The correct code for this service is 21077 (Impression and Custom Preparation; Orbital Prosthesis). Please mark the correct code by a pathologist who performed a gross post-mortem examination on a stillborn infant. The exam included the infant's brain but did not include the infant's spinal cord. The code that ought to be used is 88014 (Necropsy, Gross Examination Only; Stillborn or Newborn with Brain). Please mark the correct way to report the telephone services for a phone call in the following case: A toddler with cystic fibrosis was evaluated through a test whose outcome was suspicious enough to make the physician order additional tests. He ordered his nurse to call the patient's parents and talk about the results. The conversation lasted for 20 minutes and the nurse scheduled an appointment for the next day at 10:00 AM. No telephone consultation service code should be reported. No telephone consultation service code should be reported because the call resulted in an appointment the next day. The code 98967 (Telephone Assessment and Management Services Provided by a Qualified Non-Physician HealthCare Professional to an Established Patient, Parent, or Guardian not Originating from a Related Assessment and Management Service Provided within the Previous 7 Days nor Leading to an Assessment and Management Service or Procedure within the Next 24 Hours or Soonest Available Appointment). The correct ICD-9 is 412 (Old Myocardial Infarction). The correct code and primary procedure is 38792 (Injection Procedure; Radioactive Tracer for Identification of Sentinel Node). A patient with Type II diabetes and her physician have been trying to develop a strategy of exercise and nutrition that would ease her symptoms. Her doctor gave her a new medication that ought to control her blood sugar levels. What is the correct ICD-9 for her diabetes? The correct ICD-9 code for the patient's diabetes is 250.00. All diabetes codes require a fifth digit to be as specific as possible. Please mark the correct code for the following procedure: An early adolescent with severe acne has undergone drainage of many complicated acne pustules and comedones. Her dermatologist sutured the left and the right side and then incised, drained and marsupialized the cyst and left it open for drainage. The correct code is 10040 (Acne Surgery). It includes the opening of acne comedones, cysts, and pustules and marsupialization of the acne cysts. The correct codes for the wound repair are 12004, for the repair of the 4.6 cm and 4 cm lacerations of the left leg and right arm; 12011 for the repair of the 2 cm laceration of the cheek; 12034 for the repair of the 4.5cm and 5cm lacerations of the left arm and chest. What are the 4 organs in the lymphatic system? The spleen, tonsils, Peyer's patches, and thymus gland. The musculoskeletal section has no biopsy codes. The biopsy codes found in the integumentary section include codes for biopsies of subcutaneous structures including bone while the codes in the musculoskeletal system have biopsies for bone only. The biopsy codes found in the integumentary section are only for codes related to malignant neoplasms. The biopsy codes found in the musculoskeletal section are for deeper structures while the biopsy codes found in the integumentary section are for biopsies of the skin and subcutaneous structures. The difference is that the biopsy codes found in the musculoskeletal section are for deeper structures whereas the biopsy codes found in the integumentary section are for biopsies of the skin and subcutaneous structures. The correct codes are: 1400, for the excision of the 0.3 cm benign lesion, 11401 (X2) for the excision of both 0.7 and 1.0 benign lesions; 11402 for the excision of the 1.45 cm benign lesion; 11602 (X2) for the excision of both of the 1.5 cm malignant lesions. The correct ICD-9 code is 491.22 (Obstructive Chronic Bronchitis with Acute Bronchitis). The adequate codes are: 9214 (E&M service), 94060 (Bronchodilation Responsiveness, Spirometry), 94010 (Pre and Post Bronchodilator Administration), 94760 (Pulse Oximetry Reading) and 94640 (Nebulizer Treatment). Codes A7015, A4616, and J7630 are nebulizer treatment supply codes. This service doesn't require reporting of codes. The respiratory system subsection in the CPT manual is NOT limited to procedure codes for which of the following body areas? Though the respiratory system subsection in the CPT manual contains the nose, accessory sinuses, and trachea/bronchi, it is not limited to procedure codes. The correct code for the procedure performed by the physician is 38220 (Bone Marrow; Aspiration Only). To find ways for uncovering abuse or fraud. To create standards of electronic transactions. HIPAA was created to protect patient privacy, find ways to uncover fraud and abuse and to create standards of electronic transactions. The code that should be reported is 72114 (Radiologic Examination, Spine, Lumbosacral; Complete, including Bending Views, Minimum of 6 Views) with modifier -TC. The correct code for this service is with 62270 (Spinal Puncture, Lumbar, Diagnostic) with modifier -63 (meaning that the patient weighs less than 4 kg). The correct code for this procedure is 43337 (Repair, Paraesophageal Hiatal Hernia, via Thoracoabdominal Incision, Except Neonatal with Implantation of Mesh or Other Prosthesis). The correct level of E&M service is 99283 (Emergency Department Visit, Level Three). No code should be used for the intubation. The time spent with the patient by the provider. The appropriate category of E&M service. If the patient was new or established. The time duration of the discharge. The appropriate category of E&M service is the first thing that needs to be determined when selecting an evaluation and management code. The correct code for the procedure is 61313 (Craniectomy or Craniotomy for Evacuation of Hematoma, Supratentorial; Intracerebral) with modifier -22 (meaning that the procedure was an increased procedural service). Which of the following is the basic distinction between diaphragmatic hernia repair codes? The patient's age and the possible use of mesh. The patient's age and whether the hernia is acute or chronic. The stage and the site of the hernia. The patient's age and the site of the hernia. The patient's age and whether the hernia is acute or chronic divide the diaphragmatic hernia repair codes. Colonography is a radiographic image of the colon's interior. Encephalitis is the inflammation of the lining of the brain while meningitis is the inflammation of the spinal cord. Encephalitis is the inflammation of the brain while meningitis is the inflammation of the lining of the brain. Encephalitis is the swelling of the spinal cord while meningitis is the inflammation of the lining of the brain. Meningitis is a respiratory infection and encephalitis is the inflammation of the nervous system. The difference is that encephalitis is the inflammation of the brain while meningitis is the inflammation of the lining of the brain. The correct code is 39220 (Resection of Mediastinal Tumor). Anterior packing is done at the back of the throat while posterior packing is done in the larynx. The CPT manual contains no nasal packing procedure codes. Anterior packing is applied pressure and gauze and posterior packing is the insertion of a balloon into the back of the nasal cavity. The difference is that anterior packing is applied pressure and gauze and posterior packing is the insertion of a balloon into the back of the nasal cavity. The correct code for this service is 75625 (Aortography, Abdominal, by Serialography, Radiological Supervision, and Interpretation). The fixed payer of the last resort is Medicaid. When a dislocated joint is manipulated back into place, the subluxation is reduced. Which area will be incised if an obstetrician performs an episiotomy during delivery, in order to allow a wide opening for the baby to pass through? The obstetrician incises the perineum in an episiotomy. The prone position of a patient means that the patient is lying flat on his stomach. The correct code is 9426 (Antepartum Care Only, 7 or More Visits). The correct codes for this condition are 421.0 (Endocarditis) and 041.10 (Infectious Organism). The correct code for this procedure is 40490 (Biopsy of Lip). The Blue-Cross Blue-Shield is billed first and Medicaid second. Only the Medicaid is billed. Only the Blue-Cross Blue-Shield is billed. The Medicaid is billed first while the Blue-Cross Blue-Shield is billed second. The Blue-Cross Blue-Shield is first billed while Medicaid second. The correct code for the procedure is 99215 and it represents the management services and evaluation. What is the name of the condition that occurs when the lining of the esophagus becomes inflamed? Esophagitis is the infection or irritation of the esophagus which becomes inflamed. What is a pacemaker or pacing cardioverter-defibrillator that has pacing and sensing functions in three or more heart chambers? Multiple lead system is a pacemaker or pacing cardioverter-defibrillator that has pacing and sensing functions in three or more chambers of the heart. The tympanic membrane is referred to as the eardrum. The correct code for the collection of the blood is 36415 (Collection of Venous Blood by Venipuncture). No anesthesia services should be performed on a brain-dead patient. The anesthesia services that ought to be provided is 01990-P6. Please mark the CPT codes that ought to be reported during a cystourethroscopy performed with an ejaculatory duct catheterization and irrigation. In addition, duct radiography is performed to visualize ejaculatory duct system. The CPT codes that should be reported are 52010 (Cystourethroscopy, with Ejaculatory Duct Catheterization, with or without Irrigation, Instillation, or Duct Radiography, Exclusive of Radiologic Service) and 74440 (Vasography, Vesiculography, or Epidemiography, Radiological Supervision and Interpretation). The suffix "-megaly " refers to enlargement of the heart. When does the time reported for an anesthesia service begins and when does it end? It begins when an anesthesiologist administers the anesthetic agent and ends when the patient leaves the operating table. It begins when the anesthesiologist begins prepping the patient and ends when the anesthesiologist is no longer in personal post-operative attendance. It begins when the physician begins the procedure and ends when the physician ends the procedure. It begins when the anesthesiologist begins prepping the patient and ends when the patient leaves the hospital. The time reported for an anesthesia service begins when the anesthesiologist begins prepping the patient and ends when the anesthesiologist is no longer in personal post-operative attendance. The gland which is composed of two identical lobes and which produces thymosin stimulates T-cells to produce the hormones that regulate immune system function is the thymus. The correct code is 43328 (Esophagogastric Fundoplasty; Thoracotomy). It is found along the shafts of hard bones. It is found along the outer layer of bones. It makes up the top edges of long bones. It makes up the insides of bones. Spongy bone tissue makes up the insides of bones. Please mark the correct anesthesia code for the following case: A teenage patient is presented to an orthopedist after he fall off his bicycle. He suffered severe pain and a closed fracture to the left tibia and fibula and a severe sprain to the left wrist. He received anesthesia and the doctor manipulated the fractures back into place and applied a cast on his left leg. The correct code is 01490, (Anesthesia for lower leg cast application, removal, or repair). If it is listed as a separate procedure, the code shouldn't be used. All other elements should be coded except this element. The coding should be done only if it was the only procedure that was performed. The coding should be done only if the procedure was not performed. When a CPT code has the words "separate procedure" in parenthesis after the code description, you this procedure should be coded only if it was the only thing performed. The correct code is 51992 (Laparoscopy, Surgical; Sling Operation for Stress Incontinence). The code is listed out of numerical order. The code used to be listed with a different number. The code description has changed. The symbol # in front of a CPT code, means that the code is listed out of numerical order. The correct code or the endocrinology service located in the medicine section that allows for the ambulatory continuous glucose monitoring of interstitial tissue fluid (includes the physician's reading and interpretation of the report's findings over a 72-hour period) is 95251. The correct code is 51720 (Bladder Instillation of Anticarcinogenic Agent (Including Retention Time). They are for temporary procedures. There are only permanent codes and no temporary codes. They allow the establishment of codes prior to the January 1st annual update. They allow the deletion of codes prior to the January 1st annual update. The purpose of temporary national codes in the HCPCS Level II manual is to allow the establishment of codes prior to the January 1st annual update. What kind of clinical examples are listed from Appendix C in the CPT manual? Examples of evaluation and management procedures. In the CPT manual, Appendix C lists clinical examples of evaluation and management procedures. The doctor's work is presented by code 56440. The HCPCS Level II codes are updated every quarter by CMS (Centers for Medicare and Medicaid Services). The correct code is 50360 (Renal Allotransplantation, Implantation of Graft; without Recipient Nephrectomy) and the modifier is -50. To correct the muscle misalignment caused by strabismus. To correct vision loss due to glaucoma. To plastic repair a droopy eyelid. To repair the lens of the eye caused by . Blepharoplasty is performed to plastic repair a droopy eyelid. What should you do when listing both CPT and HCPCS modifiers on a claim? You should list the HCPCS modifier first. You shouldn't list the HCPCS modifier at all. You should only list the CPT modifier. You should list the CPT modifier first. You should you list the CPT modifier first when listing both CPT and HCPCS modifiers on a claim. The pediatrician should code the visit with 99213 (Evaluation and Management Service) and 69210 (Removal of Impacted Cerumen). The correct codes for a parathyroidectomy with parathyroid autotransplantation on a 40-year-old male patient are: 60500 (Parathyroidectomy or Exploration of Parathyroid(s)) and 60512 (Parathyroid Autotransplantation). Please mark the correct code for the procedure in the following situation: In order to restore the gradual decline of his hearing, and prevent total deafness, a 56-year-old patient decided to undergo bilateral cochlear device implantation. The doctor performed a modified mastoidectomy due to the position of the device and the size of the patient's mastoid bone that was partially occluding the patient's inner ear. This procedure was essential for the implantation of the cochlear device. The doctor used an operating microscope during the cochlear implantation. The code is 69930-50 (Bilateral Cochlea Device Implantation, With or Without Mastoidectomy).